By vintage in Category 1 on 22/07/2016 . For classic cars with engines that have trouble keeping cool, especially in the queue to get in and the queue to get out of the parking area at the chosen event, there are a number of products on the market. Try Millers Oils Motorsport Extra Cool. Millers Oils Motorsport Extra Cool is a coolant enhancer and corrosion inhibitor. 250ml treats 10 litres of water. It reduces coolant temperature by up to 15 degrees centigrade, it protects against multimetal corrosion, it reduces foaming and cavitation, prevents hotspots and is fully miscible with all antifreezes. 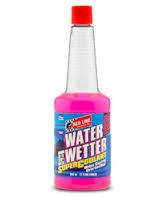 Red Line Water Wetter can be used in more modern classic sports cars. Of course, if the cooling system needs attention and is not operating to its full potential then adding a coolant enhancer will not solve the problem. Overheating can be caused by all sorts of issues. It is best to take advice before using any product.